The pub is reputedly haunted by the apparition of a man. The figure has been sighted leaning against an upstairs wall. Pictured left is the Ship Inn courtesy of Keith Moffatt. Mousehole (Cornish: Porthenys) is a village and fishing port in Cornwall, England. It is situated 2.5 miles south of Penzance on the shore of Mount's Bay. 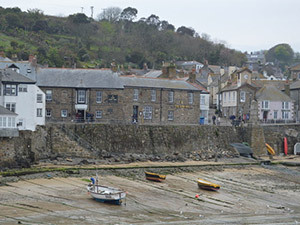 Pictured left is a view of Mousehole courtesy of Keith Moffatt. Licensed under CC BY-SA 3.0 via Wikimedia Commons.